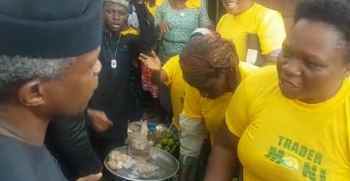 The traders in relief market, owerri were overwhelmed today as the Vice President Osinbajo and Imo State Governor Rochas Okorocha launched Trader Moni in Imo State. For President @MBuhari and I, investing in people will always be a fundamental principle of governance. Trader Moni provides collateral and interest-free loans from 10,000. No matter who you are and where you come from, investing in you is our priority. Trader Moni provides collateral and interest-free loans from 10,000. No matter who you are and where you come from, investing in you is our priority says VP Osinbajo.